A new report, Getting it right in a new ocean, launched today by WWF’s Arctic Programme is the first study of its kind to outline how the Arctic’s biodiverse ocean resources and economies can be developed to ensure long-term, economic and ecosystem health for the region and the planet. The report warns that conventional approaches to development threaten the viability of much of the region’s distinctive ecosystems, undermining sustainability for communities and economies. Arctic Blue Economy Principles in action: This fall, several Arctic and non-Arctic nations agreed to prevent unregulated commercial fishing in the high seas of the central Arctic Ocean. The Central Arctic Ocean Fisheries Agreement is unusual because currently, no commercial fishing takes place in the area due to sea ice coverage. The Arctic coastal states of Canada, Kingdom of Denmark, Norway, Russia and the United States, along with the major commercial fishing nations of the EU, Japan, China, South Korea and Iceland agreed to refrain from commercial fishing in the Arctic Ocean for at least the next 16 years. The countries also agreed to conduct scientific research required to better understand the marine ecosystems of the central Arctic Ocean. This agreement is an excellent example of how Arctic nations can lead the way by using a precautionary approach to protect biodiversity and ensure future sustainability of this globally important region. 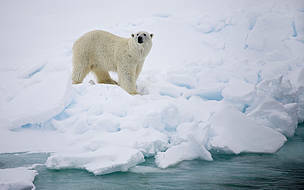 Polar bear (Ursus maritimus) in the snow, 80 degrees north, Spitsbergen (Svalbard) arctic archipelago, Norway.